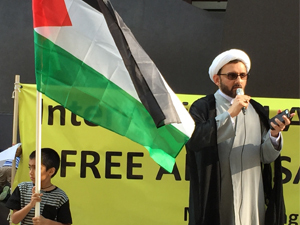 On Friday in Chicago, a diverse crowd of 250 people commemorated Al-Quds Day that takes place annually in multiple cities around the world. This year’s event was held on the one-year anniversary of the Israeli attack on Gaza. Speakers focused on the continuing siege of Gaza, the campaign to end the mistreatment of Palestinian children, and called for the U.S. to end military aid to Israel. International Day of Al-Quds is an annual event commemorated on the last Friday of Ramadan. It was introduced in 1979 by Ayotallah Khomeni in Iran as a religious duty for Muslims to show solidarity with the Palestinians and oppose Israel’s occupation of the Masjid al-Aqsa and the Dome of the Rock. 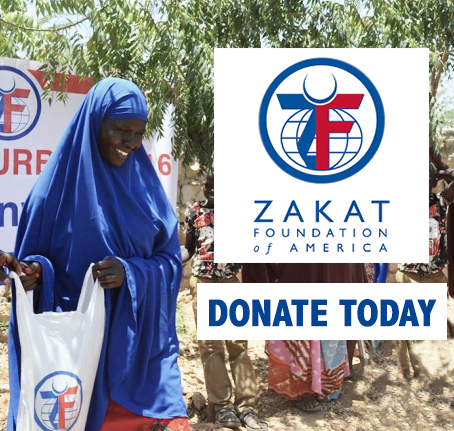 It has become an international solidarity movement for human rights open to both Muslims and non-Muslims. Al-Quds Day focuses on supporting a just peace for Palestine and opposing Israel’s control of Jerusalem (al-Quds in Arabic: القـُدْس). 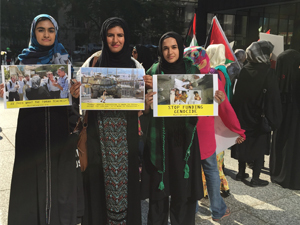 The pro-justice and anti-Zionist demonstrations are held in many Muslim and Arab countries as well as Muslim and non-Muslim communities around the world, including the United States. 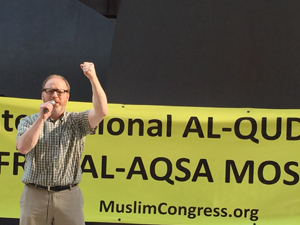 Muslim Congress is currently coordinating an effort to organize peaceful Al-Quds Day events across the world in 51 cities. Since September 2000, 9,137 Palestinians have been killed by Israeli strikes and attacks. These numbers include 2,061 children. In addition, 72,826 have been injured, thus far. We condemn the Israeli aggression in Palestine and demand the Israeli occupation of Palestine to end. The Palestinian people have the right to freely live on their land. We are gathering at the Daley Center…to protest the Israeli occupation of Palestine. We request your presence and coverage of this event highlighting the plight of the Palestinian People. Protests were held in Baghdad, Berlin, Delhi, Geneva, London, Johannesburg, Oslo, Paris, Qum, Sanaa, Sydney, Tehran, Tokyo, and many more cities. Al-Quds Day protests across North America were sponsored by the Muslim Congress (an organization seeking to promote unity among the Muslims of North America) and were held in Atlanta, Boston, Dallas, Detroit, Houston, Los Angeles, New York, Oklahoma City, Orlando, Portland, Raleigh/Durham, Sacramento, Salt Lake City, San Francisco, Seattle, St. Louis, Tampa, Toronto, Vancouver, and Washington D.C.
Joe Iosbaker from the Antiwar Committee Chicago continued the theme of not only U.S. involvement, but that of Chicago as well. One year ago, Israel launched a 51-day bombing campaign against Gaza…they claim that they minimize the deaths of civilians by the pinpoint accuracy of their bombs and missiles. Yet over 500 children died last summer, and a majority of the 2300 deaths are civilians. Yes, I believe that their weapons are pinpoint accurate. I believe it because they are made by companies like Boeing, headquartered in Chicago. Many of the bombs dropped in the past three wars on Gaza were equipped with GPS systems made by Boeing. Boeing promises that their smart bombs will hit within 30 feet of their targets. Iosbaker also reminded the crowd of the case of Chicagoan Rasmea Odeh. Rasmea is a Palestinian, who was a victim of Israeli occupation 45 years ago. She was tortured by Israeli occupation prison guards until she confessed to a bombing. After she was released from Israeli prison, she immigrated to the U.S., became a citizen and a community leader in Chicago. Then, the U.S. Department of Justice came after her as part of their attack on the Palestine support movement. Now she faces being imprisoned and deported because she didn’t say on her application for citizenship that she had been tortured by the Israelis. In September, we will travel to Cincinnati to be in court when Rasmea appeals her conviction. Please plan to go there with us, so the judges can see the breadth of her community support. 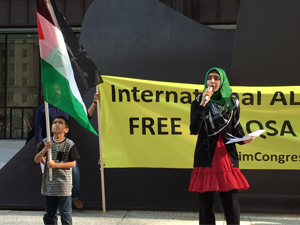 Masooma Haider, a Chicago high school student, emphasized the psychological impact the occupation and the attack on Gaza has had on the Palestinians, especially the children. The Israeli regime is also hurting the Palestinians mentally. With Israeli gunboats opening fire on Gaza fishermen just three days ago, this is a form of psychological oppression. The Palestinian Centre for Human Rights has reported four fishermen, including a child were wounded; 14 fishermen, including two children, were arrested…There has been continued arbitrary arrests and detention of Palestinian children. Between 2010-2014, three thousand children were arrested and 75% of them reported physical abuse while detained. We are here for a moral cause…Whatever the rationale for the creation of the state of Israel, the result has been oppression and discrimination against a whole group of people…We need to look at our own selves and see if we are stained by prejudice, treat others as less human. If we do that, we have no right to condemn what others do on a mass scale…We need to join hands for this humanitarian cause. 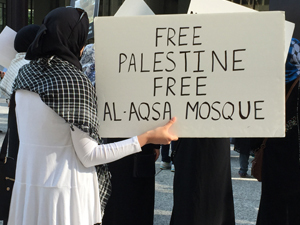 This year’s Al-Quds Day in Chicago was characterized by the continued number of Muslims and non-Muslims alike who participated as well as the anti-war and human rights organizations who came to show their solidarity for the Palestinian people.